What is this craze, the Red Velvet cupcake craze? This must be the funniest trend ever. I know that this cupcake originated in the deep south of the USA in the 50’s. However, I still think it’s a little bizarre. This cake / cupcake flavour became the hottest food trend in the mid 2000’s. One of Britain’s top bakeries at the peek of the trend in 2011 was selling 440.000 Red Velvet Cupcakes per year! That is a huge number of Cupcakes, let alone a single flavour. What perplexes me is that truly it doesn’t taste like a specific flavour, you know like a Peanut Butter Cupcake or a Banana Cupcake… it tastes like not a chocolate cupcake and not a vanilla cupcake…. it’s like a hybrid between the two classic cupcakes but with food colouring and a few extra ingredients. Don’t get wrong, I love my red velvet cupcakes with a serious pillow of Vanilla Buttercream and when the mood strikes a Cream Cheese Buttercream but really, red cake…. it also happens to be one of my best-selling cupcakes, I am convinced that I make the best Red Velvet cupcakes in Montreal, but I still wonder why it’s such a hot commodity. As I continue to ponder the reason behind the trend, boom, out comes an even more bizzaro Cupcake trend, a Blue Velvet… There is a bakery in Los Angeles that is opened 7 hours per day and is line up the entire day and people are waiting in line for, yeah, you guessed it, a blue velvet cupcake… Being the cupcake addict that I am and on my mission to offer the trendiest and most delicious cupcakes in Montreal, I have created my own version of this Blue Velvet Cupcake. I must admit that it’s delicious. 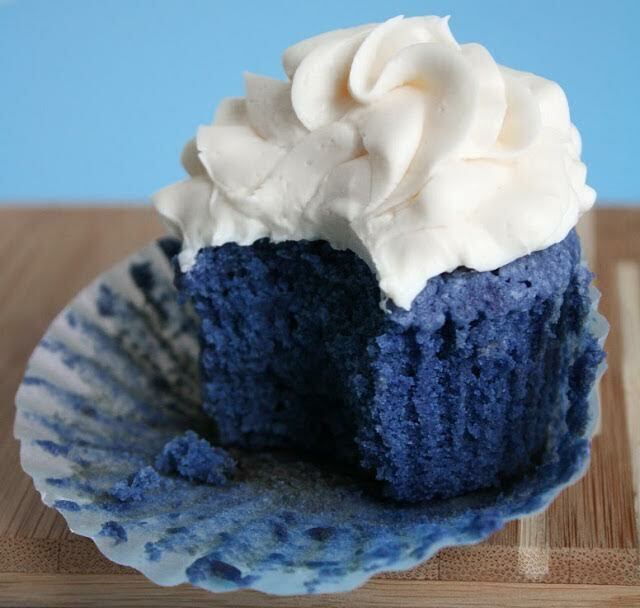 Let’s get real for a second though…it’s blue cake…with blue icing…. I am now beginning to realize the madness behind the trend. It is not necessarily just the flavour that people enjoy but the entire experience whisks you back to your childhood in an instant when coloured cake and frosting was a delicious treat, it meant fun! I guess as a baker and now a bakery owner I had not focused as much of my attention on the experience that people were having as much as the quality and flavour. I am realizing now, that yes quality is 100% the top priority and flavour is also the top but that the entire experience is what creates the perfect cupcake craze. From the feeling, you get when you walk into our hot pink Montreal bakery, to the second you walk up to our display counter filled with our homemade delicious desserts and treats, to the music playing in the background and the interaction with the Barista Cupcake Guru behind that counter…the explanation, the transaction process, the packaging or the plate it’s served on, these components are to be factored in. All together the pieces make the perfect set, the perfect experience will make your cupcake that much more delicious and then the buzz will start. Next thing you know, it’s a trend. Whether you are in Montreal for business or pleasure, make sure you stop by to either have a Classic Red Velvet or it’s new hot rivalry the Blue Velvet. Whatever velvet is your fancy be sure to try one of our crazy cupcakes and take five minutes to enjoy the whole scene, not just the cake and I am certain you too will be hooked to this new trend. Red Velvet or Blue Velvet not your thing? No problem! 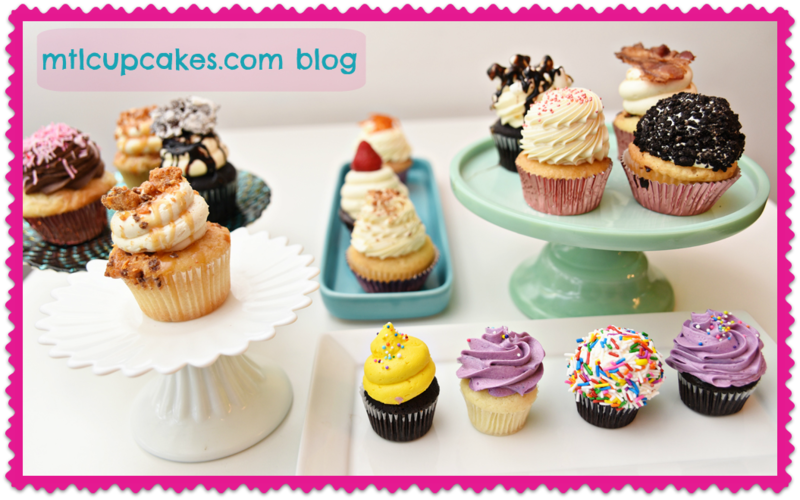 Check out all our cupcake flavours. We have something for everyone!